Provide comfort for the family of Kent Gebauer with a meaningful gesture of sympathy. Kent Alan Gebauer, 63, died Thursday, February 7, 2019 at the Kearny County Hospital in Lakin, Kansas. He was born January 11, 1956 in Brush, Colorado to Ed & Winona (Wagner) Gebauer. 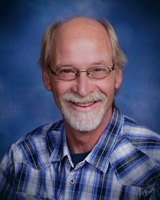 Kent graduated from high school in Hebron, Nebraska in 1974. He then served in the United States Navy from 1974 to 1980 on the U.S.S. Nimitz. After his military duty, he worked for National Cash Register as a computer repair technician on computers that were as large as a room, to computers that were the size of a cash register. He then worked for several years as a truck driver for Navajo Trucking Co. and May Trucking Co. Kent was very active in Boy Scouts and earned his Eagle Award, the Order of the Arrow, and he attended the National jamboree in Idaho in 1972. He was a member of the Lakin United Methodist Church, the Ancient, Free and Accepted Masons, and the Order of the Eastern Star. Kent enjoyed camping, fishing, bow hunting, target shooting, yard work (specifically trimming trees), and puzzles. He had a quick wit and it was not uncommon to find him laughing harder at his jokes than anyone else. He is survived by his mother Winona Gebauer of Lakin; a brother Kurt Gebauer of Pueblo, Co; a sister Lisa Grant of Lakin; seven children Matthew Gebauer of Caldwell, Idaho, Jolise Gebauer of Boise, Idaho, Katrina Gebauer of Boise, Idaho, Becky (Jack) Rodgers of Napa, Idaho, Phillip (Misty) Kreissler of Boise, Idaho, Erica Clegg of Fairbury, Nebraska, & Justine Davis of Boise, Idaho; and 11 grandchildren Kenna Gebauer, Evelyn Gebauer, Kailey Clegg, Nathan Clegg, Hannah Rodgers, Layla Rodgers, Reece Shan, Riley Shan, Kaedence Whitehall, Brooklyn Timothy, & Jules Kreissler. Kent is preceded in death by his father Ed Gebauer; a brother Michael Gebauer; and his grandparents Henry & Lorene Wagner and August & Nellie Gebauer. Funeral service will be held at 1:30 p.m. on Monday, February 11, 2019 at the Lakin United Methodist Church in Lakin, Ks with Rev. Ivan Milosi officiating. A graveside service will be held at 1:30 p.m. MT on Tuesday, February 12, 2019 at the Akron Cemetery in Akron, Colorado. Friends may call from Noon to 8:00 p.m. on Sunday and from 9:00 a.m.t o 11:00 a.m. on Monday at Garnand Funeral Home in Lakin. The family suggests memorials given to the Lakin United Methodist Church or to the Lakin PRIDE Committee both in care of the funeral home. To plant a memorial tree in honor of Kent Alan Gebauer, please visit our Heartfelt Sympathies Store. Our condolences to my cousin Kent's family. This was a good and kind man that did more in his quietness then most do in in the limelight. Although I hadn't talked to him in many years, I have fond memories as a child spending time with him back in Nebraska and at family reunions. My prayers go to Aunt Winona, and my cousins Kurt and Lisa for their loss. May God bless you and know he is in a place of rest and joy now with God the Father.